Based in the US Virgin Islands, Aqua Action can train you to scuba dive, and take you on scuba or snorkel trips. 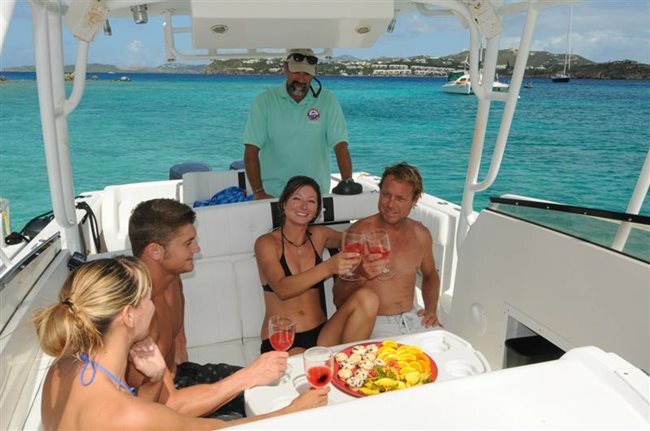 They’re the official provider of water tours to two major resorts, Secret Harbor and Margaritaville, and have a second boat that does dive trips to the British Virgin Islands as well. They kindly allowed a review of their “open water” training, a stage of learning scuba under the PADI system. Scuba diving is about as difficult as learning to drive. You first read a textbook, watch a video, and take tests, and then go for “confined dives”, which is scuba training in shallow water. We chose to get all of that out of the way back on the mainland United States, and it wasn’t much fun. You unfortunately must invest quite a bit of time and money into scuba based on faith, before you really know whether you’ll enjoy diving. But then you go for the open water dives, which can be quite fun even though it’s technically just training. That’s because you’re in the real ocean, not a pool, and may see coral and sea creatures. The open water training is really just to show that you can handle yourself in the water and to practice emergency techniques that you should never need if you’re someone like me who only plans to dive unathletically, with a guide who has a trusted reputation. Aqua Action is based on the beach at Secret Harbor, one of the top resorts on St. Thomas. When I got out of my car at Secret Harbor, I got lost for a few moments, and a member of staff not only stopped what he was doing (and he was clearly in the middle of something and heading the other way) and walked me down to where I could see the beach. Now that’s what I call service! There Aqua Action has a small dive shop there where you can buy snacks, sunblock, sunglasses, and all kinds of gear. If you’re spending the day at the beach there, you can also rent kayaks, paddle boards, and beach chairs too. Setup on shore was quick and convenient. Then surprisingly it was only a ten-minute boat ride to the dive and snorkel location, the fastest of any snorkeling trip that I’ve ever been on. My group had three staff, Sam, Courtney, and Abby, and seven tourists, some of us planning to snorkel and some planning to scuba dive. It was good to have the option to do either at a single ocean location, because not everyone in your group may have the preparation and training to go scuba diving, even on a lesson. (I read on the Secret Harbor website that they do offer a Discover Scuba Diving experience that requires no experience, but is limited to the shallow near-beach water where you can stand.) It rained a little that day, but we were already about to get wet, and underwater we wouldn’t care, of course. Staff were very encouraging, with Sam and Courtnie having the most energy. They’ll make you feel safe and will help you through the training patiently, without making you feel like you need to be macho. They gave me and the other divers some instruction on the boat, and then we went for a training dive with Abby and a “fun dive”, a dive that didn’t count towards training but that we had the time for. Abby helped us with our underwater signs and getting our scuba gear set up and taken down. We went down nearly fifty feet, I believe. Even going on an educational dive, you always hope to see large ocean animals, as we did in a similar experience at the Coki Dive Center. There’s no way to know whether any will be nearby, however. Under the crystal clear water, we saw a ton of coral, with lots of small and medium sized fish of many different types and colors. 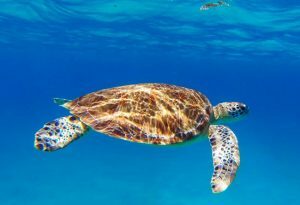 Although we divers saw no big fish or large animals, the snorkelers at the surface did see sea turtles! As is true with all dive tours, food was limited to snacks on the trip, so that no one felt bloated going on the second dive. Going out with Aqua Action was a good experience, but more a straightforward excursion than an exceptional one. Staff didn’t befriend us on the trip or chat us up extensively. Cameras are not allowed during training, but I was surprised that for the “fun dive” that no one on staff had an deep dive camera to bring along. (Scuba is great for photos and video, because it looks like you’re doing something superhuman but really does not need to be athletic as long as you are comfortable swimming slowly.) Unfortunately, Aqua Action didn’t have fins in my admittedly giant foot size. So I did get some sores on my toes, and one fin’s latches came off, on both swims. Walking out from the beach on sharp rocks was uncomfortable, and I would have liked permission to wear my water shoes, just for that, even though they are not allowed to be worn on the boat. After we returned, there was more waiting than expected to get our proof of training signed. But we had a good time, appreciated the encouragement of staff, and how they didn’t turn safety into a chore. Aqua Action also offers night snorkels and dives off of Nazareth Bay, and even once set up a haunted underwater trail of spooky objects to find, for a Halloween scuba event. 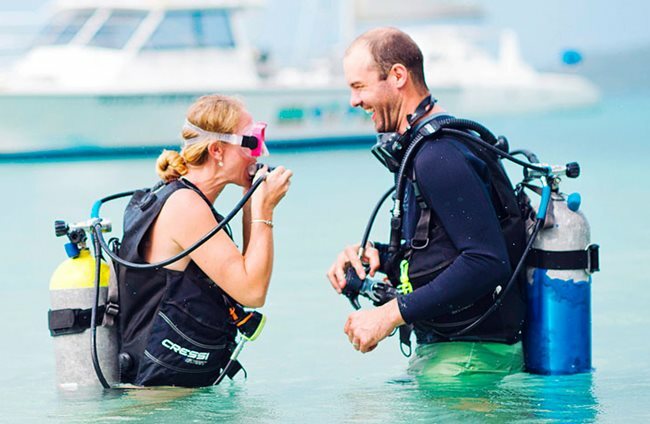 They can also train you to be a PADI scuba dive instructor, a rescue diver, divemaster, and more. They will can organize an underwater dive wedding for you! Their website also mentions kayaking, hiking, Coral World, and zipline adventures, but I think those are just referrals to other tour companies. It’s hard to give a rating with just one experience, and it’s tempting to assume the best and give a full 5 stars to Aqua Action. But for the experience I actually had, this time I’ll give 4.5 stars. You’ll have fun and do something daring and amazing in a completely safe and cared for way, a bucket list item to brag to your friends about. Aqua Action is a major reason why you might want to choose to stay at Secret Harbor.